“The Story of Eva” is a 60 min. documentary that captures this remarkable woman’s legacy and shows the power for good a dedicated person can have. It will serve as a tool for discussing difficult history, discovering shared values and encouraging peace and kindness. A discussion following the screening will be led by Diane S. Reid, Senior Lecturer in Communication Studies at IUS (Feb. 4th and Feb. 9th). Fred Whittaker, a religion teacher at St. Francis of Assisi, will lead the discussion on Feb. 27th. Whittaker has taught Holocaust courses for 17 years. “Eva: A-7063” is a 90 min. documentary that builds upon “The Story of Eva,” including 30 minutes of bonus footage and commentary. Friday, March 1st, 7 PM – 9 PM*, The Floyd County Library * After-hours screening. Enter at main entrance. 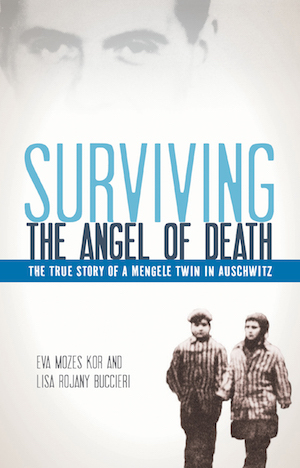 Read about Eva’s harrowing experience as a child in Auschwitz, the largest Nazi death camp, in this story of resilience and survival. A FREE copy of the book is available for all registered participants. Pick yours up at the Library’s Customer Service Desk or at Galena Digital Library. 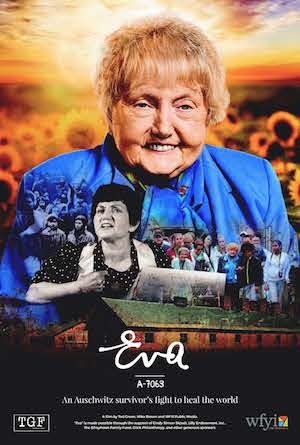 Eva Mozes Kor was 10 years old when she arrived in Auschwitz. While her parents and two older sisters were taken to the gas chambers, she and her twin, Miriam, were herded into the care of the man known as the Angel of Death, Dr. Josef Mengele. Mengele’s twins were granted the “privileges” of keeping their own clothes and hair, but they were also subjected to sadistic medical experiments and forced to fight daily for their own survival, as most of the twins died as a result of the experiments or from the disease and hunger pervasive in the camp. In a narrative told with emotion and restraint, readers will learn of a child’s endurance and survival in the face of truly extraordinary evil. This young adult novel is recommended for ages 12 & up. Saturday, Feb. 23rd, 1 PM – 2 PM, The Floyd County Library Auditorium (Adult discussion) Led by Steve Burks. Tuesday, Feb. 26th, 12 PM – 1 PM, The Floyd County Library Auditorium (Adult discussion). Led by Melissa Merida and Sandra Fortner. Thursday, Feb. 28th, 5 PM – 6 PM, The Floyd County Library Auditorium (Teen discussion). Led by Janie Whaley.